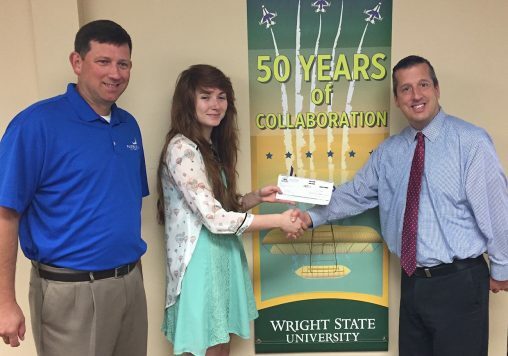 Wright State student Rosa Tweed receives a $750 check from Rob Anderson, Fairborn city manager, left, and Pete Bales, Fairborn assistant city manager as the winner of a banner design contest. As Wright State University students return to campus for fall semester, they are greeted by colorful banners commemorating 50 years of collaboration between the City of Fairborn and the university. And the colorful banners were designed by Rosa Tweed, a Wright State student with a double major in biological sciences and print making. She is the winner of Fairborn’s banner design competition that garnered her a $750 prize. The contest was a partnership between Fairborn and the university to provide Wright State students with a passion for art the opportunity to submit banner designs highlighting the collaboration between the two entities. The City of Fairborn then purchased 55 banners displaying the winning design and installed them along Colonel Glenn Highway and a portion of North Fairfield Road. Tweed, who has done a few other small graphic projects like T-shirts, said winning this competition was not only fun, but also a good challenge. Entrants were required to follow branding guidelines for Wright State and Fairborn, so students gained some marketing skills in the process. Tweed compared the contest to a scavenger hunt because she had to sift through brand guidelines to know what designs and colors were acceptable. She then began creating thumbnail sketches over the course of a few days. As for the prize money, Tweed will use it to help pay for vaccinations and miscellaneous travel fees for her upcoming trip to Costa Rica with the Wright State Department of Biological Sciences. Like many students, she has a love for the arts and sciences. To see more artwork created by Tweed, visit www.artofcentauri.com/. As Wright State celebrates its 50th anniversary, it is fitting that the banners carry the theme of 50 Years of Collaboration. Many Wright State students, faculty and staff also live in Fairborn, called a City in Motion. Originally founded as a branch campus of The Ohio State University and Miami University, Wright State became an independent institution in 1967. It celebrates with a special Homecoming celebration Sept. 29 through Oct. 1.